The two leading Republican candidates seeking to become California’s next governor failed to win the required delegates for a state party endorsement during this weekend’s GOP convention in San Diego. Rancho Santa Fe’s John Cox along with Chula Vista native and Orange County Assemblyman Travis Allen squared off on San Diego Bay during the California Republican Party Convention, where delegates gathered to hear the candidates speak. When it came down to Sunday’s endorsement vote, Cox edged out Allen — 55 percent to 41 percent — leaving both candidates short of the required 60 percent of delegates needed for a state party endorsement. Cox supporters sought to suspend the rules for a re-vote in hopes of reaching the 60 percent threshold, but that motion failed to win support, according to Capitol Public Radio. Despite not gaining the endorsement, Allen took to social media to claim a victory of sorts. “Chicago John Cox just BLEW his best chance to BUY the CA Republican endorsement. Today’s NO ENDORSEMENT marks the end of the era of establishment progressives like Meg Whitman and Neel Kashkari buying off the CA Republican Party! !” he tweeted Sunday. A statement issued by the Cox campaign pointed out that their candidate received more votes than the opponent, which they saw as a positive heading into the June primary. “John Cox has the resources and support to take the fight to Gavin Newsom on June 5th and November 6th,” John Cox for Governor campaign spokesman Matt Shupe said. 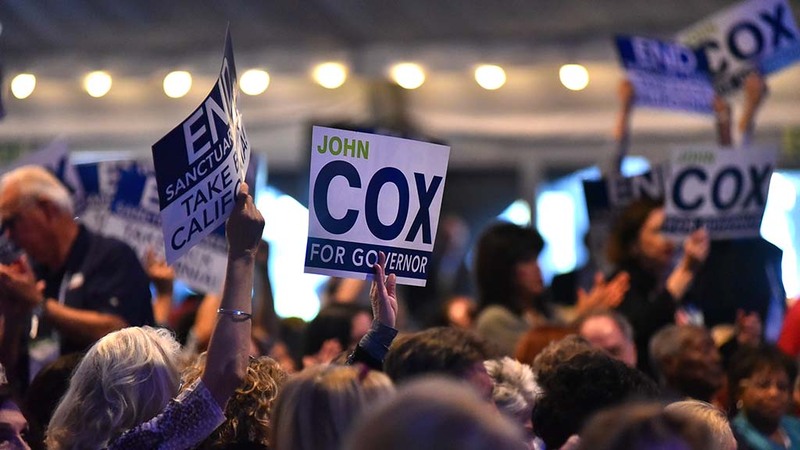 “The voters of California and the delegates to the California Republican Party are uniting behind John Cox’s message of economic growth and this convention is just another benchmark to show that Cox is the best candidate to face and defeat Gavin Newsom in November,” Shupe continued. Only the top two primary finishers — regardless of political party — will advance to the November general election. If there is no GOP gubernatorial candidate come November, some fear Republican voter turnout could slump. A falling off could put California’s embattled GOP members of Congress at risk, further jeopardizing the party’s House majority. Rep. Mimi Walters (R-Irvine) offered an ominous picture of Democrats working to flip those California districts.